Click on the symbols for further details. Even from a distance you notice them, the delicate yet strong blue lines, drawn horizontally or vertically on a white or orange background, sometimes running parallel and then crossing each other or wrapped and tied, knotted in a loop, moving in a circle, very much in evidence and never straight. 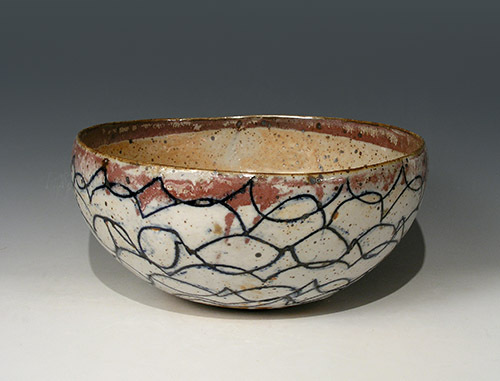 Karin Schweikhard, ceramist and painter, drew them with a light touch, freehand and precise. 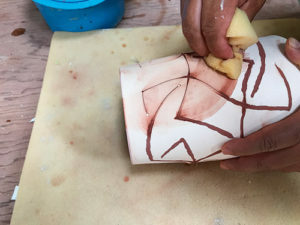 To enhance the three-dimensional effect of the lines, she does not apply them with a brush or pencil on the surface but embeds them more deeply in the glaze. Like a net the lines stretch over the vessel, clothing it and emphasising its form. A delicate fabric that wraps itself around the body of the vessel and continues beyond the edges. Line as a link between interior and exterior. Even the line of a shadow fleetingly cast on the wall of a vessel by a crooked roller blind as she is glazing outside in the summer, leaving its mark there, can be the stimulus for a new design. Then there are the pieces that have colour as their theme, placing less emphasis on graphic elements. Colours are used that only develop their full effect through their juxtaposition. Freely designed, animated ceramic images evolve in earth shades and clearly defined areas of colour. Fired clay body as the support for the brushwork. Planar compositions that in their cipher language perhaps reflect and the express experience and dreams of this widely travelled artist. Joo Young (Grace) Han graduated with a BFA from Dankook University in South Korea, an art faculty that focused on traditional Korean ceramics. It was at Dankook that Han learned by observing the master, Joon Hoon Park, and by throwing daily hundreds of Korean tea bowls, known as sabal. Over time, she became proficient in using the Onngi wheel to create the large earthenware vessels used to store water and fermented food such as kimchi. 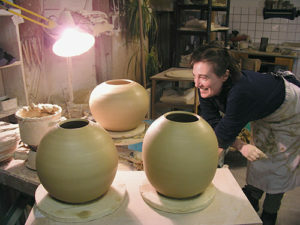 From 2004-2011 Han continued to perfect her ceramic skills before moving to Canada. On June 3, 2016, five years after arriving on the Canadian prairies, Han graduated with her MFA. She struggled throughout her graduate studies to find her own voice, somewhere in the middle of being a traditional Korean potter and a new Canadian studying pottery in a Western tradition. 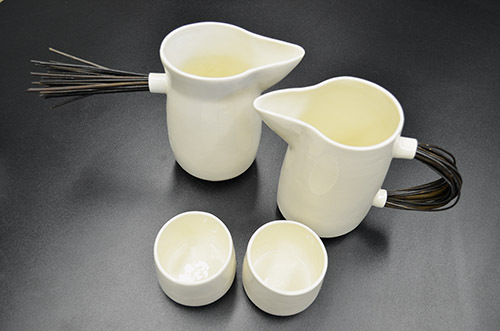 Today she is one of the rising stars in Canadian ceramics. Han remembers there was no need in Korea to explain the work she was making because the vessels spoke for themselves. She said, „When I made an Onngi jar in class, I did not have to explain what it was, what techniques I used, and why I made it. It was simply an Onggi jar – everyone in the room knew its history, what it was and what it was used for.“ As a graduate student at a Canadian University, Han found herself in the middle of this debate early in her term as a graduate student. More and more she became uncomfortable and even angry when asked to defend her work. She did not want to argue whether or not what she was making was „art“ or „craft“. For Han, there had never been a distinction. In Korea, everyone knew that ceramics was a very respected “art” form. 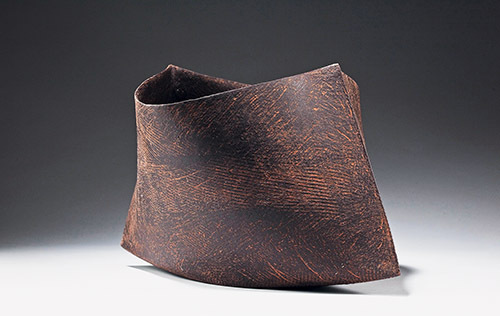 Rafa Pérez (Spain, 1957) has a very personal approach to clay as an artistic medium. 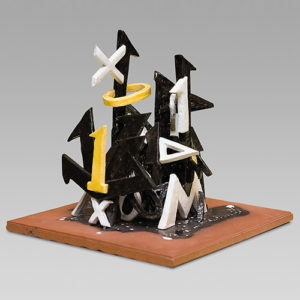 He uses it for his recognizable black and white abstract sculptures, but also in murals and even paintings. In fact, painting was the discipline that saw him enter the art field, and one that he keeps practicing today. His drawings feel light-hearted, more like a game, colourful and varied, with a plastic language of its own. 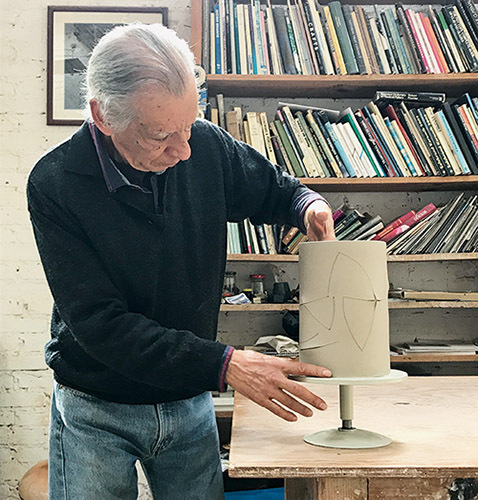 As if the artist could feel liberated from the technical restraints that clay imposes on the brave ones that dare to search for a very personal path. 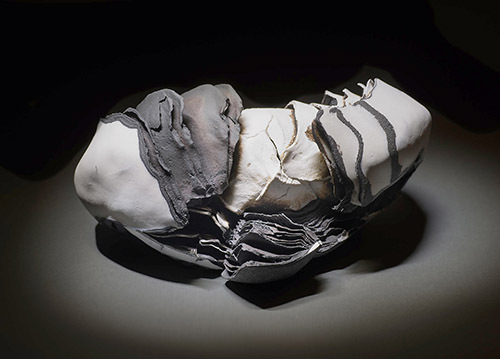 But going back to ceramics, Pérez’ creations find their place in the wave of various ceramists who have worked on the recovery of a primitive sense of ceramics since the beginning of the 20th century. 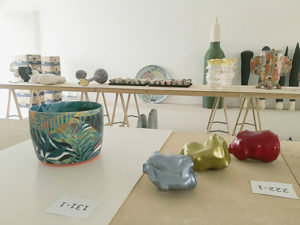 From then on, ceramics has not been merely a craft any more, nor a material for figurative work, but a medium that allows the artist to withdraw and let the material talk its own language. Naked clay and natural processes – so real, tangible and immediate – are more than enough to express abstract, refined and very contemporary meanings. The potter works here like an orchestra director of the elements, who sets the guidelines but is not the final player, who trusts the team and doesn’t strive to control. The outcome is partly unexpected because it depends on many other factors, which gives the work a plus of vitality and depth. As Rafa Pérez himself recognizes, this unpredictability is one of the highlights of his job: opening the kiln and surprising himself. To be worthy, every artwork must be a find. The difficulties of representing the immaterial in material form are those of reifying a conceptual paradox. As Alberto Giacometti discovered when he attempted to describe the nothingness of Sartrean consciousness through the physical medium of sculpture, the artist cannot make the intangible simultaneously tangible. To effectively engage the intangible one must employ a strategy of analogy (as in the beauty of ornamental Islamic scripts and the numerous examples of spiritually expressive abstraction in the Western tradition) or seek ways of prompting epiphanies by opening spaces for contemplation beyond the physical (as in art of the various sects of Buddhism). The latter point is no doubt why the Abbot Suger, early advocate of the Gothic style of architecture, designed his famous glass-walled chancel at St. Denis as a liminal space of suffused light: an aperture between a world of material being and the realm of spirit. 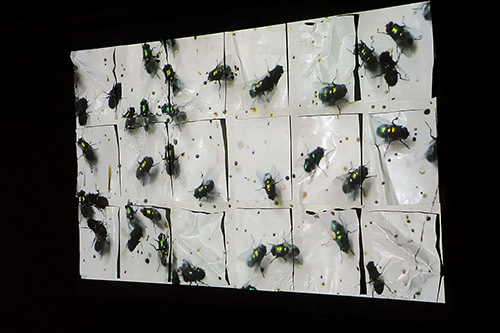 Gaps, voids, interstices: these have often been devices for intimating spirit in art. Korean ceramist Dong Hee Suh, who explores her Christian faith through clay, relies on interstices to conjure spirit, but she does not trade representation entirely for nonobjective form. Works with such titles as Garden of Eden and Tree of Knowledge are suggestive of floral imagery, but only to the degree that the tracery of a Flamboyant Gothic window vaguely evokes vines and tendrils. Suh’s forms might be more aptly compared to lyrical devices in poetry such as rhyme, alliteration, or crescendo: means of conveying otherwise incommunicable emotion. Her works seek to adumbrate spiritual realms that can be intuited but not captured with the clarity of more concrete modes of representation. Her medium is more properly the empty space in which faith operates rather than the matter that is subject to empirical experience. A Chinese proverb says, „When the winds of change are blowing, some people build walls, others windmills.“ The wind of digitality has to change ceramics if it is to continue to develop. What did people need to know in the Stone Age to model a Venus figurine? They had to know that they could only do it with clay and, later (from about 8000 BCE), that it hardened if it was fired. This was what had always been given. Everything that came later was what had never been. And what had always been given did not disappear the world of things became more and more diverse. That is the way of the world, and of opinions. Is this tendency to cease in digitality? We can only wonder at how things have turned out and are turning out. Now, after millennia of the evolution of the brain, during which more and more new things have emerged that had not previously existed, digitalization is a major step. Its roots go back a long way. With two characters, the ancient Chinese prophesied the future, written down in the I Ching, The Book of Changes, from the 3rd millennium BCE. Then zero had to be invented. Manises – a ceramics town in sunny Spain. The townscape, heavily shaped by industry and which initially seems somewhat plain, does not indicate at first glance how much ceramics culture is concealed there. However, a second glance reveals small potteries dotted around town and a quantity of elaborately painted tiles, ornately decorating whole façades. There is a tradition of lustre ceramics here, impressively demonstrated by the dome of the church of San Jaun Bautista, which is entirely clad in lustre. Ceramics production goes back to the 14th century in Manises. 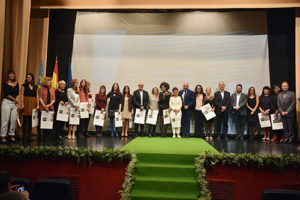 The local ceramics culture from those days up to the present is presented for interested visitors at the Museo de Cerámica in Manises, under its director Sara Blanes. Against this backdrop, the Manises municipal authorities called for entries to the 13th International Biennial of Ceramics in 2017. The aim is the furtherance of outstanding ceramic artists in the fields of fine art and product design. A particular focus of the 13th Biennial is on gaining a wider audience for ceramics in art and also on promoting innovative design ideas. 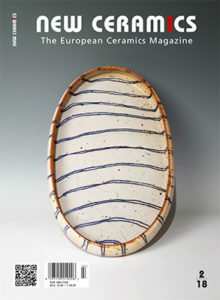 Not least, the event is also intended to raise awareness of Manises as a ceramics centre. Up to 2001, participation in the Biennial was only possible for Spain and the rest of Europe. International orientation promises greater attention and above all greater diversity. 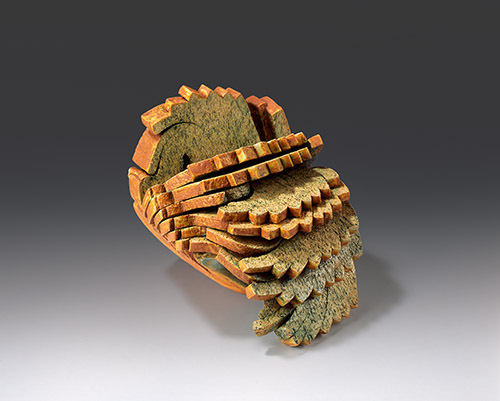 Subsequently, ceramic artists from all over the world have thus been able to enter. In 2017, a total of 213 applications from 33 countries was received. Finland has a long common border with Russia. The ceramics of Russia are however not as well known here as Central European ceramics, even though the contacts in arts and crafts were once lively with our eastern neighbour, especially at the turn of the century 1900. Many Finnish craftsmen had then settled in St Petersburg and Finnish companies like AB Iris exported unique ceramic artwork to Russia. These contacts diminished after the First World War and the cultural life in our two countries developed in different directions. Today we can note new cooperation developing in the field of ceramic art. 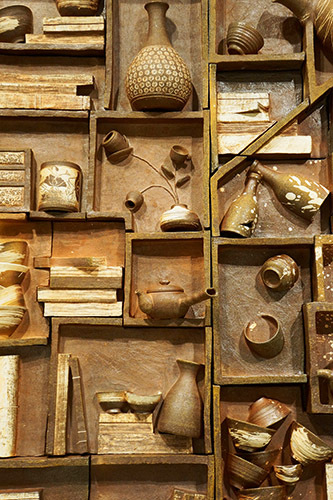 The International Academy of Ceramics IAC is not only a forum for discussion. It promotes international cooperation in a concrete fashion. Natalia Khlebtsevich, teacher in the department of ceramics at the Stroganov Academy in Moscow participated in IAC´s congress in Barcelona and met there the Finnish artist and ceramist Johanna Rytkölä. The correspondence between these two artists resulted in an invitation to four Finnish artists and some Russian colleagues to build a joint exhibition in the gallery of the Stroganov Academy. This academy is called in English Stroganov Moscow State Academy of Arts and Industry. Lord Sergei Grigoriyevich Stroganov, patron of the fine arts, founded it in 1825. One of his ancestors is known for the famous dish called Beef Stroganoff. Today 60-70 students study in the department of ceramics, which has four electric kilns and one gas kiln. 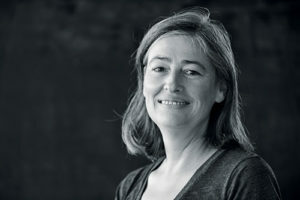 The Head of the Ceramics Department, Elena Yudina, has an international background and grew up in Paris, where she also studied. In its almost two-hundred-year history, the school building has experienced and survived a great deal: several Russian tsars, two world wars, Latvia achieving and losing independence, the Soviet Union, a fire and recovering independence. “Catherine’s School” or the Katharinaeum was erected on its current site in 1820 and soon set to work – with modest facilities including fourteen sets of bookshelves, nineteen school benches, two blackboards, three teacher’s chairs, two icons and a portrait of Catherine II, the tsar of Russia. The school was named in her honour because Riga was a part of the Russian empire at that time. From then on, the building housed a school in which both boys and girls were trained in various handicrafts, with special courses for teachers. In 1993, this evolved into the State School of Arts and Crafts where in 1934 the ceramics department was opened. It is interesting that at this time, exhibitions were already being organised at the end of each semester, presenting around 2,000 works by the students to the public, 20 santims admission for adults, 5 santims for students. Up to 1937, the school participated in several international exhibitions, twice being awarded the Grand Prix and once a diploma of honour in Brussels. Madara Duka. Tableware set Maija un Paija. Porcelain, glaze, willow rods. Project management Daina Zvanitaja, supervised by Ainars Rimicans. 2017. Ömür Tokgöz was born in 1966 in Afyon, Turkey. 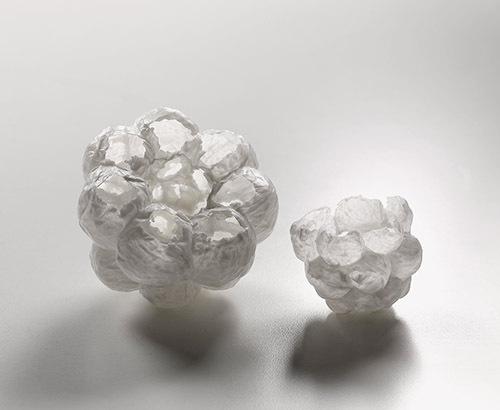 She employs slip casting to create a light volume and a silk-thin quality. Vessel-like but not vessels, these objects with a diversity of appearance provide new imagination and possibilities to the shape of ceramic works. Yeo Byong-uk was born in 1969 and is based in Seoul, Korea. The simple shapes combine hard features with soft ones. Straight lines are unexpectedly softened by gentle curves. When the viewers look at the seemingly unadorned, solitary shape, they are attracted by its steely or wood-like colour or texture. Gustavo Pérez follows no trends in ceramics and does not want to know what is currently in vogue. He prefers to draw inspiration from classical music and good literature. Or from an idea that he had as a child and that then, decades later, floats up to the surface. Gustavo, I wonder: does your work have a pre-Hispanic background? I have of course great interest and attention for the pre-Hispanic past of Mexico. But my own work does not consciously try to get anything from it, nothing at all. Whatever influence can be found (or imagined) from this historical background is the result of an unconscious process, never something I look for. It is interesting to realize that in some cases, there can be something characteristic in what I make that can be thought of as Mexican, but I definitely refuse (and dislike) the idea of consciously using some examples of the past as models for what I make.